The National Conference meetings of CPM began in Hyderabad. on the occasion, CPM national leader Sitaram Yechury said that communalism in the country is increasing. Corruption and impropriety are increased , he said He said that only the Left parties has the power to stop attacks on communal forces and have to work for communal and social struggles.He said that the attacks on Dalits and Muslims in the country have increased and such a communal will threaten the unity of the country. 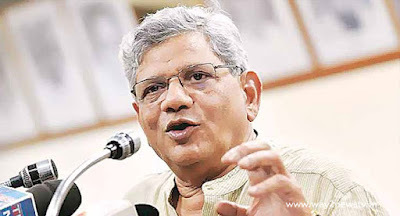 The Left,secular and the democratic forces must meet to defeat the BJP in the next election. The agriculture crisis in the country, unemployment has risen, and on the other hand the central government is in favor of corporate forces. Millions of crorepatis are losing corporate money. Dalits and Muslims targeted. It is a big blow to the unity of the country, "he said. Class struggles and social struggles should work together. He said 22 national conferences will be directed towards united movements.